Over the Top R&R Condo at Moclips. Hot Tub. Do you spend your days dreaming of the beach? How about being as close to the beach as possible? Come out to Ocean Shores where you'll find us - the Lower part of R&R. While you'll get lots of Rest and Relaxation here, the name really stands for Retreats and Reunions - If you book both the Upper and Lower portion of R&R, you can bring up to 24 people! R&R Upper is new and features three bedrooms with two queen sized beds in two of the bedrooms, and the third bedroom sporting two sets of bunk beds. There are also two sleeper sofas in the large living room allowing for those extra guests to crash. So while there’s plenty of room for the whole family inside the big house, we all know you really want to be on the beach! 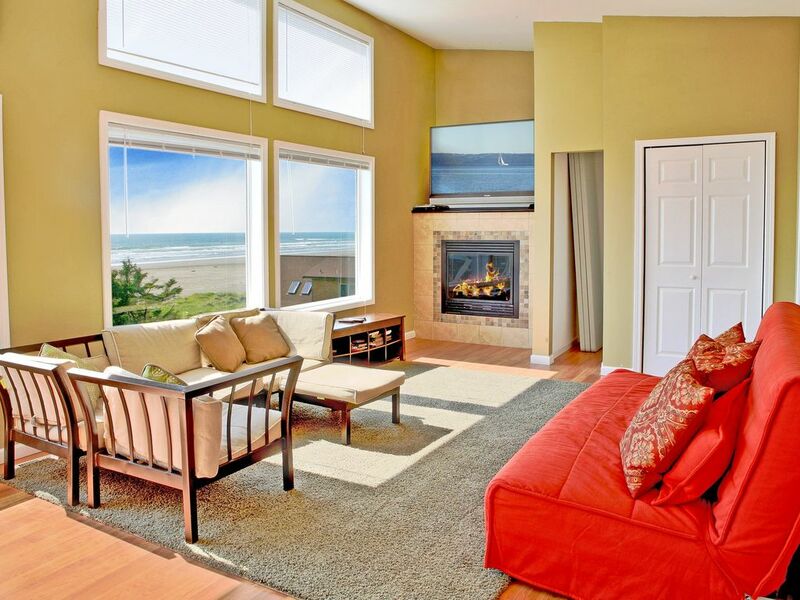 "If you want a beach that is virtually private, then you will love Moclips." Cozy up in front of the fireplace at the end of the night. Don't forget to bring along your furry friends - we're dog friendly because we know how much pups enjoy the sandy beaches! The kitchen is fully stocked for you and your guests to take advantage of when cooking. With an open layout, the dining area has an oversized table for the whole gang to sit at and enjoy a meal together. The condo was very clean, great view, lots of sleeping spaces, 2 big bathrooms, good supply of "start up supplies". This property is all about location. The property was very clean and is well appointed especially in the kitchen though it has not been well maintained. The location of this property is incredible. You could not get better beach access! The property is very well appointed in the kitchen and the views are simply stunning.